COMPANY PROFILE The Federal Bank Ltd is an India-based commercial banking company. The company generates the majority of revenue from the Indian market through the provision of corporate and retail banking, treasury and capital markets services. Federal Bank is an India-based commercial banking company. The company operates through a network of branches and ATMs across India. The company’s business segments consist of the treasury segment, which includes trading and investments in bonds, equities, and mutual funds, derivatives trading, and foreign exchange operations; the corporate/wholesale banking segment, which offers loans and other banking services to corporate and other large clients; the retail banking segment, which provides lending and other banking services to individuals and small-business clients; and other banking operations, which contains parabanking activities and other banking transactions. The company generates the majority of revenue from the Indian market. At the price of INR77.95 as at 16 Jul 2018, The Federal Bank Ltd is trading at a Price to Book Ratio of 1.2 times current book value. 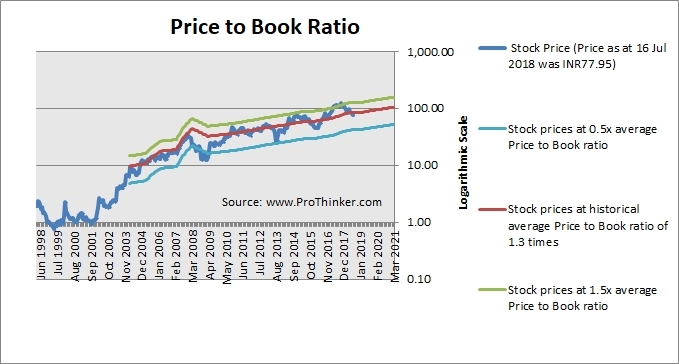 This is a 7% discount to its historical average Price to Book Ratio of 1.3 times.